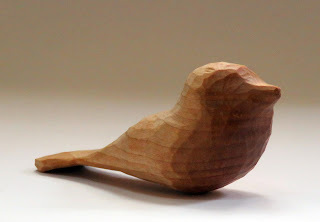 With just a knife, we will carve a "Comfort Bird" in basswood. This is a small, highly stylized bird that can be held in the hand to relieve stress. You will learn how to hold the knife and to carve safely. You will also learn about grain direction. We will discuss how to keep a knife sharp. A Comfort Bird is best left unfinished and unsanded. A knife, carving glove, and blank will be provided. You will leave the class with a finished bird.